Home/Grout Shield/How Applying The Products By Grout Shield Can Make Your Home A Show Place. Are Grout and Caulk the Same Thing? How Applying The Products By Grout Shield Can Make Your Home A Show Place. In the kitchen and the bathroom clean, sealed grout is a must!!! That is why the tiles on the walls and floor must be presentable every day, or they will make the entire house miserable. The kitchen and the bathroom are the most important rooms in the house, because everyone in the house, whether family or guest, uses both these rooms every single day. As the grout that has been applied to all the tiles in the bathroom becomes dirty over time, getting on your hands and knees to scrub it away is not only exhausting, but bad for your health, too. This is because the positions you must get into in order to thoroughly clean all the grout in between the tiles, can give you body aches that take days to recover from. The same bodily punishment can come with doing the same cleaning job to the tiles in the kitchen, except the kitchen is worse because it covers a larger area than the bathroom. However, if you take the time and effort to apply Grout Shield to all the grout, the cleaning work is a breeze. You know very well that when people walk on any tiles, the dirt on their shoes comes off and stains the grout. Unless you take the time instantly when the dirt hits the grout to clean it, the grout is immediately stained. That is why Grout Shield is so important, because it takes the hard manual labor and eliminates it. It also makes the entire wall and floor look like the experts just laid it yesterday. If either the bathroom or kitchen look filthy from stained grout, people tend to lose their neighborliness quickly. And, if the stained grout is in the kitchen, people also tend to lose their appetite. 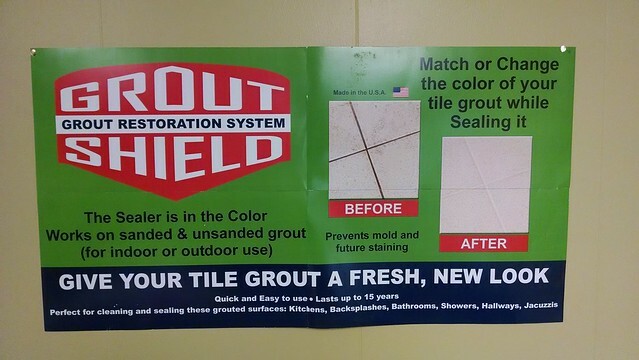 The products from Grout Shield do three things, protect, color and seal the grout! Great Shield has colors to match whatever color scheme is in your home. There is something to be said for just white grout, which is treated with Grout Shield. It is bright, shiny, and beautiful when polished. However, if you choose to add color to the grout, the beauty is magnified exponentially. That is the great value of this company, they bring out the beauty of your home, when you didn’t know it was there. All you have to do is go to https://www.groutshields.com and order everything online. It will be sent to you in a few days, and you can enjoy all the greatness of the products. All you have to do is clean the tiles on the floor and walls, apply the products and the colors properly, and within a few hours, your days of having a dirty home are gone. After the application of the proper products, in the proper order, all the spills of liquid and drops of dirt can be so easily wiped off. Very few times does this kind of tile protection come along, and everything within the financial reach of the common person. But, with the dawning of the 21st century comes new technological cleaning products that enable you to be able to clean the home much easier and faster. Actually, if you are laying the tile yourself, and you have Grout Shield products with you from the start, you will never see a dirty bathroom or kitchen ever. This is the pure professional way of manufacturing that the company does. We pride ourselves on our customer service as well as our products! The Best Grout Products Money Can Buy!